Would you like to have Fara come to your town?? Have Fara teach classes and workshops. Host a public class, or series of workshops and have Fara Tolno come teach in your town! Fara is known around the United States and abroad as one of the world's finest teachers of West African Drumming and Dance. Not only has he acheived mastery as a djembefola and dancer, but he has dedicated his life to becoming an amazing teacher. As a teacher, he is patient, kind and generous. He has an uncommon ability to help students of all levels achieve more than they thought possible. Let Fara choreograph and arrange for your performance group! Getting ready for a big show, or just ready for some great new material? Fara can work with your troupe to arrange percussion sets and dancer choreography for groups of any size or skill level. Fara's experience as the lead drummer of Les Merveilles de Guinea as well as his MFA in Dance gives him a unique set of skills to take your troupe to the next level! Have Fara come teach at your local school! Invite Fara or one of Project Drum's highly trained instructors to work with the students in your school. Sharing this powerful music with children is at the heart of our mission. We offer programs from one day to several weeks. While we believe that working with students in relatively small groups provides the richest learning, we can accomodate up to 300 students per day. 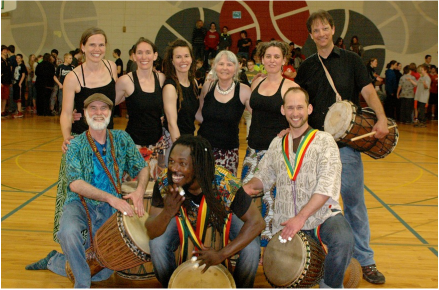 Our instructors work with students in many areas of West African percussion and dance. From hand drumming basics to body percussion, musical notation, dance and ensemble drumming, students of all levels are nurtured and challenged. Project Drum is one of the most flexible and versatile organizations out there! We custom tailor our programs to meet the specific needs and goals of your school, including many Colorado State Educational Standards. One of PD’s many options, includes a student “Showcase Performance” which can stand alone or be combined with a performance by PD’s professional troupe, Kissidugu. Fill out the form below or visit our contact page to get Fara to your town!